How to get PokerStars rakeback. Visit the PokerStars website through this link. Enter the PokerStars marketing code THEPOKERBANK.COM when creating your account. That's all you have to do to start earning "rakeback" from the PokerStars loyalty program by trading points for cash. Standard PokerStars rakeback does not exist. However, they do offer a generous VIP points program that allows you to redeem your points for cash in their VIP store. So basically, you can get a form of "rakeback" at PokerStars, but it's just given out in an alternative fashion to standard the standard rakeback rooms. In this article, I will use my best mathematics skills to try and figure out how much "PokerStars rakeback" you will effectively be receiving based on their points system and cash rewards from their store. Points earned at the basic rate. $1 rake = 5 points. Rakeback = n/a - You need to be at least silver star to get cash rewards. $1 rake = 7.5 points. $666 rake paid for $50 bonus. $1 rake = 10 points. $2,500 rake paid for $285 bonus. $1 rake = 12.5 points. $4,000 rake paid for $650 bonus. $1 rake = 17.5 points. $5,714 rake paid for $1,500 bonus or $14,285 rake paid for $4,000 bonus. Rakeback = 26.2% to 28% (The bigger the cash reward you wait for the higher the effective rakeback). $1 rake = 25 points. $4,000 rake paid for $1,500 bonus or $10,000 rake paid for $4,000 bonus. Rakeback = 37.5% to 40% (The bigger the cash reward you wait for the higher the effective rakeback). Use the PokerStars VIP calculator to work out which level you are/will be playing at. Note: These are rough rakeback estimations based on my calculations as outlined below. However, I believe that they are very close to the actual percentage of effective rakeback you would receive for your play at PokerStars. For the vast majority of players who play at the $200 NL stakes or lower, the effective rakeback is going to be lower than the rakeback available at the standard rakeback rooms. If you are a regular grinder at the $400 NL tables or higher, after reaching the Supernova level (which will take a year) you can expect to receive around about the same rakeback percentage as you would at Full Tilt through exchanging your FPPs for the cash rewards. The PokerStars rakeback is most beneficial for the players who manage to make it to Supernova Elite status, which requires you to regularly play at some of the highest stakes available (check the VIP calculator). In which case, you can expect to receive effectively more rakeback than you can get at most other rooms. How to work out PokerStars rakeback. Before we start, let's get clear on a few things so we all know where we stand. PokerStars does not offer a set rakeback amount like Full Tilt and other rooms do. However, they do offer cash rewards for collecting FPPs (player points) by playing for real money. So essentially, you are getting a form of rakeback at PokerStars. It's just not as obvious. I am going to roughly work out how much rakeback you can get by trading FPPs for cash rewards. 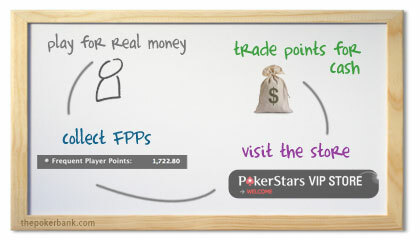 I will be using the FPPs and VIP store information from the PokerStars website. There will be some mathematics involved in this article, but it's nothing too heavy. PokerStars rakeback is on a sliding scale. Another important point to remember is that there is a sliding scale for the amount of FPPs you earn at PokerStars. The more you play the faster you will earn FPPs, which means you will be able to redeem greater cash rewards more quickly. Therefore, there will also be a sliding scale for your effective rakeback at PokerStars based on how much you play, quite like the sliding scale for Betfair rakeback. Working out the effective PokerStars rakeback. First things first, we need to find out how many FPPs we receive for the rake we pay at PokerStars. I am going to go off the amount of points received for every $1 paid in tournament fees to keep it simple. $1 of rake = 5 FPPs. The size of the cash reward. The FPPs needed to get the cash reward. We can then figure out the amount of rake we have paid and compare that to the cash reward we get back to figure out our effective PokerStars rakeback. The basic PokerStars rakeback equations. These rakeback equations work on the basic level and result in an effective rakeback of between 5% and 8% if you are receiving basic FPPs. However, I will now work out the effective rakeback at PokerStars for each VIP level by factoring in the increased rate of earning FPPs. Rakeback for each VIP level at PokerStars. At each level you can only earn a specific cash reward for a set number of points. These have been outlined for each level and used to work out your effective rakeback. To work out which level you would be playing at, you can use the handy PokerStars VIP calculator.